I was planning on building a new computer with an IT friend of mine, probably in January. But, yesterday my computer caught fire. Fortunately we have fire extinguishers (which we'd never had occasion to use). So, after I recovered from the shock and the horrible smell, I went to a local computer shop and bought a new one. It's not quite as fancy as what I was meaning to build, but I can't get by with just my phone, because I do the books for my husband's business. New machine: AMD Ryzen 1800x 3.6-4 ghz, 8 cores. 16gb ram. liquid cooling. NVidia GeForce 1080x. I haven't tried starting Banished yet. I'm a tad concerned because this machine has DirectX12, and I'm not sure what's going to happen. I'll be trying it later. Right now I'm downloading various programs so no gaming for me yet. Have any of you had problems playing with DirectX12? ouch,i do hope you had a lot on a backup to save reloading and detroying everything.hopefully your IT guy will help recover some files.good luck with the new 1. I have been running on DirectX12 for a long time and never experienced anything bad. Oh my, @Goblin Girl , your computer caught fire!!! I am so sorry to hear that. Do you know how that can happen? That is something I never thought to be worried about. I know nothing about Direct x12. I hope your new computer works great for many years and never has any problems. I think that DirectX is always backwards compatible so that for example version 12 can also just do everything the versions 9, or 11 can do. Only if some games are designed for DirectX 12 a computer with DirectX 11 or lower cannot run it without upgrading to a video cart what supports DirectX 12. WOW !!! Banished Gods !!!! i am telling you ! You have a godly computer there !! I spent 1/3 less on it than my max budget! I wanted a machine that would play AAA games on Ultra, for years to come. And it has pretty red LED lights inside, and one side of the case is tempered glass so I can see 'em. The local computer shop built it for me in 4 hours. Fortunately I'm pretty religious about backing up my data, and I now store all my photos in the cloud, so I didn't lose anything of consequence. @galensgranny it was a pretty old computer, that had been upgraded several times. The case was too small for ideal air flow, and the CPU chip overheated. And to be honest, I didn't clean out the dust as often as I should have. The case was really hard to open, and I'm lazy. The glass side on my new case will allow me to monitor how dusty it's getting, and it's easy to remove. Plus I won't be keeping it on the floor this time. You bought yourself allmost a dream machine. May it serve you well. And it has pretty red LED lights inside, and one side of the case is tempered glass so I can see 'em. The local computer shop built it for me in 4 hours. i have almost pretty the same... i have that 1700+ and my MB is ASUS with red light lines moving on it. 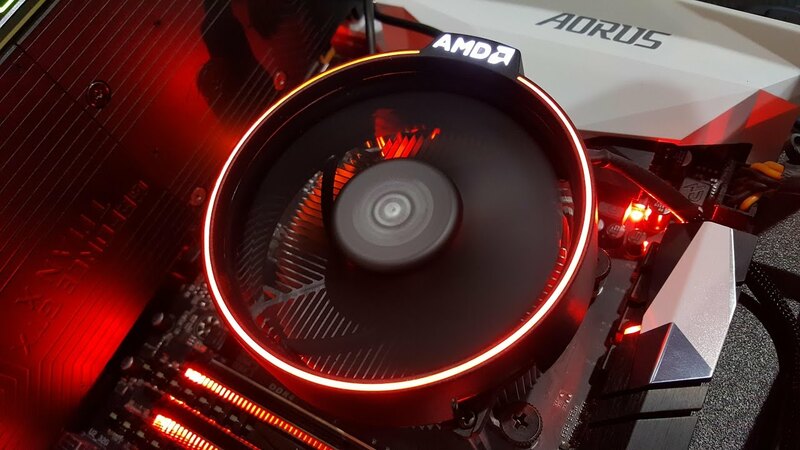 and i use the Wraith CPU Fan that came with the 1700+ it has also a nice red light too. Good Lord! I had no idea I was hanging out with such a high end crowd! Fast Ryzens, GTX 1080s and flashing lights besides! Now my LEDs are glowing green with envy--though I wouldn't want a computer fire to get there. That is some scary [expletive deleted]. Congrats (i guess?) on the new computer.